Reviewing "You Know I'm Right: More Prosperity, Less Government"
From its inception, the conservative movement has always been founded on books. The left often likes to make feel-good arguments that cannot bear deep analysis; most conservative thought, in contrast, requires serious explanation and consideration to get its point across. That's one reason that successful talk shows are conservative - there simply isn't that much that's worth saying about liberal ideas. 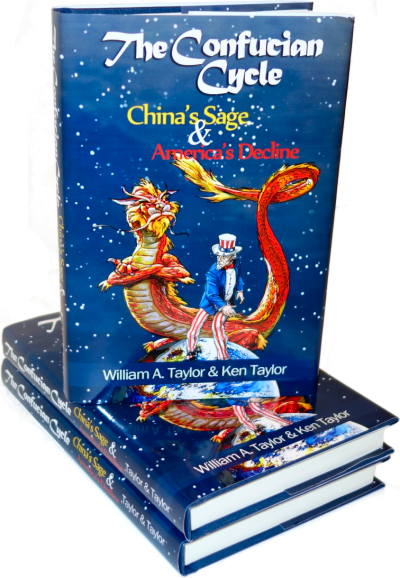 While there are many great conservative classics, not too many young moderns walk around carrying The Wealth of Nations; they prefer more current and less intellectual fare. 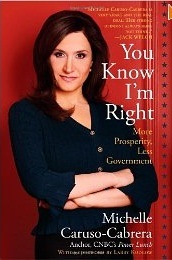 So we are very glad to see You Know I'm Right: More Prosperity, Less Government by Michelle Caruso-Cabrera (Simon & Schuster), which rolls out a full set of answers for the most important issues of our day. I never used to be a political person. In fact, I used to hate talking about politics... What I've learned from the BP oil disaster, housing debacle, and financial collapse is that government is overregulating our lives, and yet it's never going to protect us. As conservatives, it's easy to get bogged down in the details: this corrupt politicians, that unwarranted government intrusion, the other egregious tax. You Know I'm Right goes straight to the first principle: that you and I know how to run our lives better than the government ever can, so why should it try? Which is not to say the book is devoid of facts; far from it. Page after page overflows with dates, names, costs, and details of mistakes by both parties, from big-spending President Bush to the impending bankruptcy of Social Security, Medicare, and Obamacare. Because we have the world's reserve currency, we have a distinct advantage over everyone else: when our finances go to hell and the world is on the verge of crisis, our borrowing costs actually go down, because so many people out there want to own U.S. Treasuries, the safest investment in the world. There is no other country out there with that blessing. That's but one example of the real strength of this book: it says what conservatives have been arguing for years, but restates the arguments in terms non-conservatives can understand; gives evidence and supporting proofs without an intimidating avalanche of data; gives clear prose without high-flying rhetoric. I don't want Washington insiders to tell me what to think and how to behave in the privacy of my home. Agreed, wholeheartedly! The problem is that, for example, homosexuals demand not just personal privacy but public acceptance and acclamation, and abortionists wish to end the life of a genetically distinct human being. Her privacy principle is sound, however, and provides a firm basis for conservatives to clearly explain its limits. There are countless Americans who first encountered conservatism via talk radio and through regular listening have been converted. That's more difficult these days because of a never-ending stream of liberal invective aimed at Rush, Sean Hannity, and the others. Instead of the big names whom many people will dismiss out-of-hand, why not send someone Michelle Caruso-Cabrera's book as a stealth weapon to do intellectual combat on your behalf? Even if the only result is that a liberal thinks a little, the world will be a better place. I've long hoped for a Scragged "book review" corner. Never heard of this person before you mentioned her. Thanks! Glad to hear that the idea of Scragged book reviews is appealing! We'd be happy to do more of them. Authors or agents, please contact editors(at)scragged.com for information about how to submit your book for a review. From its inception [?] the Conservative movement has founded on the principle that what was good for our fore-fathers is good for us: slavery, the aristocracy and witch hunts, to say nothing of burning them too..
by definition Conservatives want to restore the past: it's up to those of us who can still think independently to pick one: Imperial Rome, the blood lust of Vikings, the Inquisition or its British counterpart, the Roundheads & their puritanical militarism, the French Reign of Terror, cavemen barbarism..? I say we reject the past and choose liberty over the religious zealotry [& ignorance & hate] of yore, and reject the notion that any government is the answer: we need only our liberty and the zest to protect it. Moxy, your self-contradictions are mind numbing. You reject the conservative movement, and then reject big government. Conservatism isn't "by definition" a wish to "restore the past". If people like you actually knew anything about history, you'd know that "the past" was nothing but Monarchies and Authoritarianism and Totalitarianism. The American fore-fathers left that past behind. The Inquisition and its British counterpart were specifically the kinds of things our fore-fathers (who were Christian/Puritan/separatist/etc) were RUNNING AWAY FROM. Make a New Year's resolution to buy yourself a history book on modern European history and another one on American history.